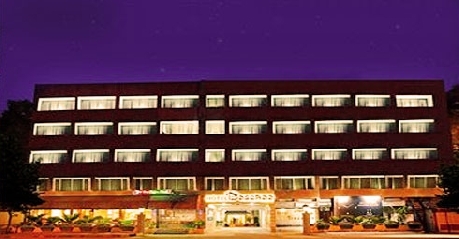 Hotel Baseraa is a three star property located at the heart of the Hyderabad city. 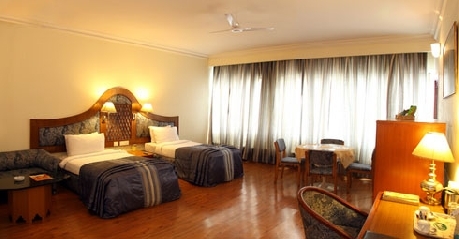 The hotel offers 77 air conditioned rooms along with a variety of ding options. 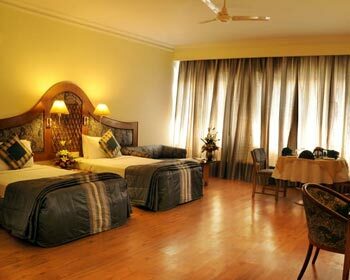 The hotel is very close to major tourist spots such as Golconda fort, Hussainsagar Lake and Charminar. The hotel is just 7 kms away from the Nampally railway station. The hotel also offers excellent conferencing and banqueting facilities. The open garden lawn is ideal to host corporate as well as private parties. There are three additional banquet halls along with boardrooms and meeting halls. The swimming pool and fitness center help take care of the guest’s health even on a vacation. Other facilities of this hotel are laundry service, free valet parking facility, boardroom, doctor on call, chargeable Wi-Fi services, dedicated front desk, travel desk and round the clock room service. 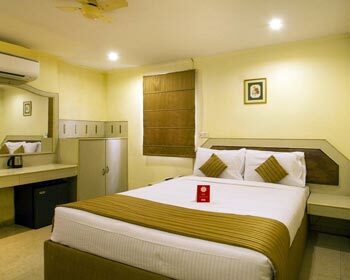 The standard rooms of the hotel are very subtly designed and come with all basic amenities for a comfortable stay without burning a hole in one’s pocket. The room is spacious enough for a couple and comes with a color television equipped with more than 100 premium channels for entrainment. The attached private bathroom comes with a shower cubical and all required bathroom toiletries. The room also has a mini bar, air conditioning, safe, Tea/Coffee maker, electronic safe, color television, towel set and 24 hour room service. 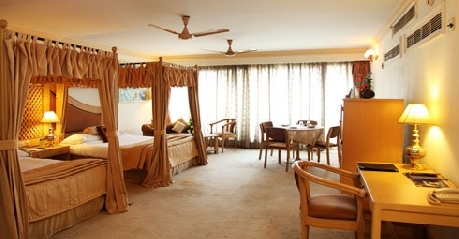 The deluxe rooms give the guests some privacy and come with some added amenities. The room has antique styled wooden furniture and a dressing table equipped with a huge makeup mirror. The attached bathroom is huge and comes with a shower cubical and a bathtub. The work desk comes with night lamps and all required stationary. Other basic amenities of this room include work desk, electronic safe, telephone, 24 hours room service, Multi-channel TV, iron and ironing board and hot and cold running water. 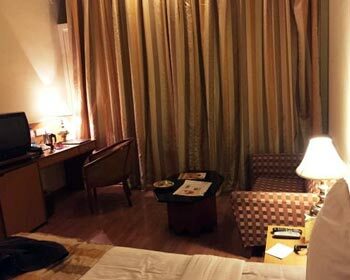 The super deluxe rooms are big compared to its predecessors and have elegantly designed wooden interiors giving the room a royal look. The room has a tea or coffee maker and a mini bar which make sure the beverages are always handy for the guests. The room has a well-furnished work desk along with the required stationary. 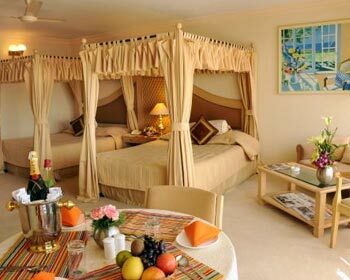 The bed is decorated with rich fabrics and comfortable cushions. The sitting area has well cushioned chairs with a center table ideal for the patrons to enjoy a quality time with friends and loved ones. The room service is of the best quality and the en suite bathroom comes with an extended towel set and a bath tub. Other amenities of the room include an electronic safe, hair dryer, mini bar, tea/coffee maker, color TV, hot and cold running water and a 24 hour room service. The executive room comes with large bay windows which offer a spectacular view of the Hyderabad skyline. The magnanimous room comes with a wooden King size bed which has been beautifully decorated with neat cotton linens and cushions to put the guests off to a good night's sleep. Slippers, bathrobes and a towel set are provided in every executive room. The private bathroom has a handheld showeranda deep sunk bathtub.The color TV comes makes sure the guests are always entertained and connected with the outer world. The guests also enjoy the complimentary breakfast throughout their stay. The other amenities of this air conditioned room include a minibar, coffee and tea maker, a separate dining area, electronic safe, hair dryer, color TV, hot and cold running water and a 24 hour room service. 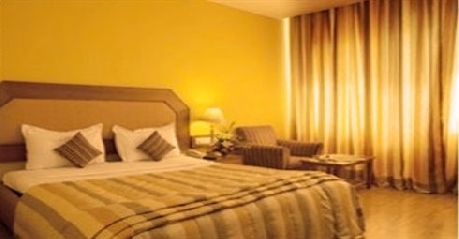 The Presidential room is meant for the people looking for a long stay of leisure and luxury with family. The room has a dining area which can comfortably seat four people for a private and cozy meal. The separate sitting room is furnished ideally for the guests to sit and catch up with old friends. The large king size bed is decorated with colorful lines and cushions. The guests enjoy complimentary breakfast during their stay and the room also has a color TV for entertainment. The workspace is very ergonomically designed for the corporate travellers and comes with night lamps. 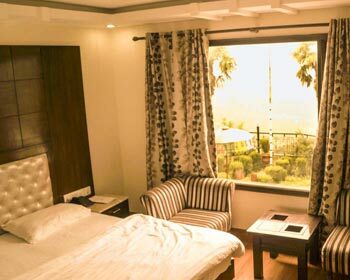 Other amenities of the presidential suite include work desk, 24 hours room service, electronic safe,Tea/Coffee maker, iron and ironing board, Snack basket, attached bathroom with toiletries, Direct dial phone facility, Mineral water and geyser connection. 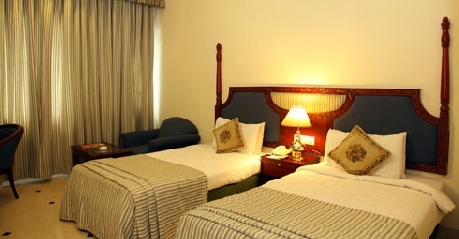 Baseraa hotel provides 77 spacious and well selected Rooms. All rooms are generously and wonderfully furnished and come along with facilities as direct dialing facility, air conditioner, individual thermostat control, color televisions, satellite channels. This latest addition to the hotel is a 24 hour coffee shop located at the lobby level. The place offers a variety of burgers, falafel and pizzas for its guests to gorge on along with some hot tea and coffee. The place also has a unique zero hour meal which consists of some authentically prepared Biryani served at midnight. 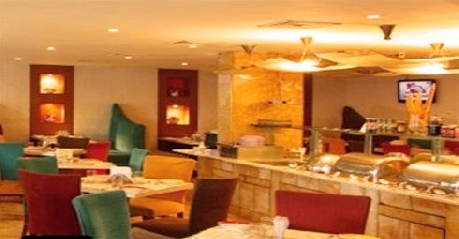 Mehfill is a multi-cuisine restaurant of the hotel serving some of the most delicious Indian and local delicacies. The place has been decorated in a very traditional manner and serves authentic dishes for dinner. 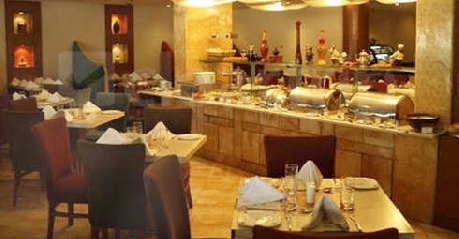 The restaurant serves Indian, Hyderabadi, Continental and Chinese dishes. This pub is the only cricket themed pub of Hyderabad. One can enjoy a unique experience of a cricket game here while enjoying some drinks from the tastefully decorated bar. The pub serves a wide variety of liquors, cocktails and wines.